As seen in earlier section, the gravitational field strength acting on an object decreases (illustrated by an increase in the field line spacing) as the object moves further away from Earth. This means that field strength varies with distance from the source mass (in this case, the Earth). 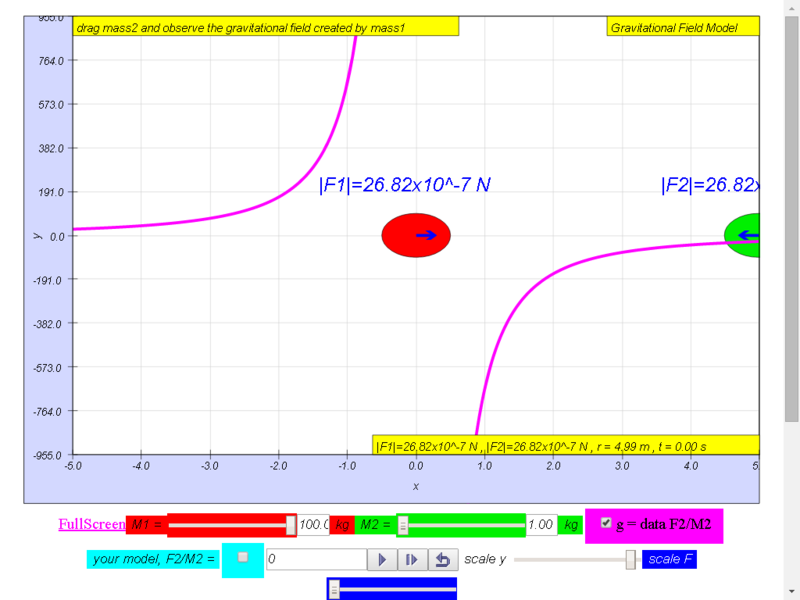 The gravitational field strength, g at a particular point in free space is defined as the gravitational force per unit mass acting on a point mass placed at that point. Why must it be a “point mass”? Point mass is physically small so that the forces acting on different parts of the point mass are generally the same. 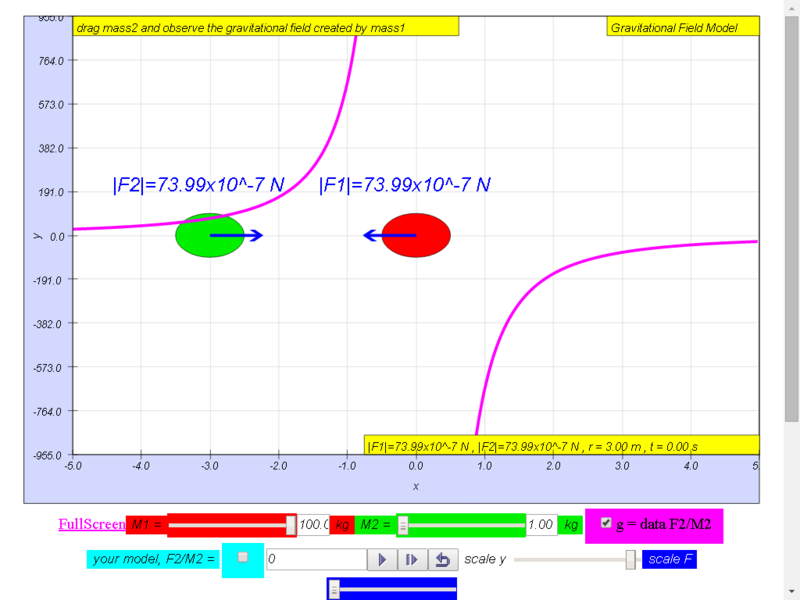 and gravitational field strength, g is the gravitational force, F per unit mass acting on the point mass, m, we may derive that the gravitational field strength. since we know the force on object as a result of the gravitational field created by Earth is F = mg.
the following shows the different g field strength at different positions away from the mass M creating the gravity field strength g.
Notice the values of g changes direction left (negative) to right (positive), suggest whether g field is a vector (magnitude and direction) or scalar (only magnitude, no direction) quality. 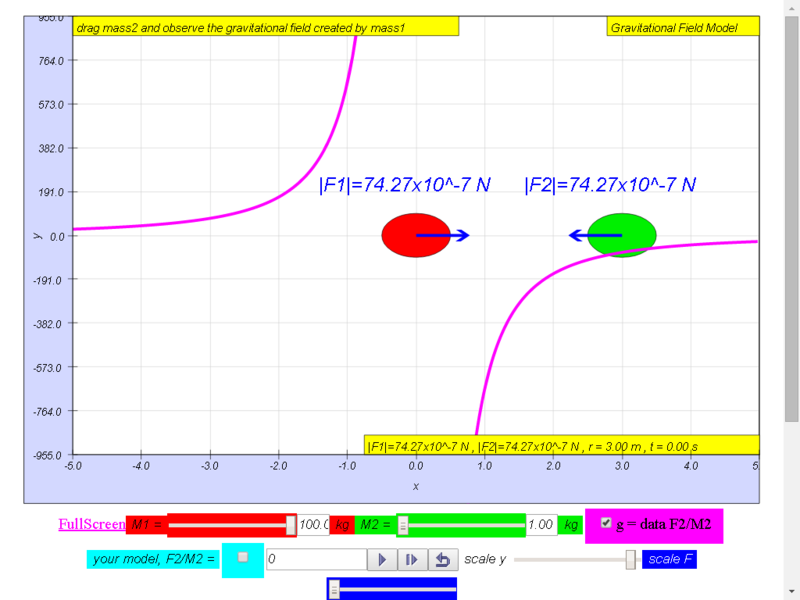 1) Gravitational field strength, g (depicted as a magenta color curve) is a vector quantity, and it has the direction always towards the mass M.
Try varying the values of the green test mass m, does it change the value of g? 2) As shown in g = G M r 2 , the gravitational field strength of source mass M , g is independent of the mass at that point, m.
As depicting in the pictures above, the values of g changes according to what relationship? linear, quadratic, inverse square etc? 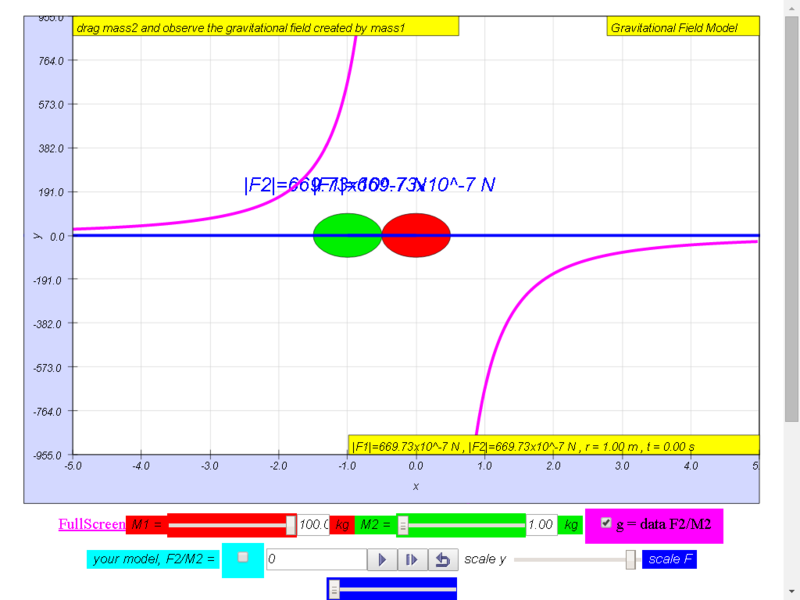 try your own model by keying expression to test linear = "r", quadratic = "r^2", inverse square = "1/r^2". which model seems to depict the g well enough? 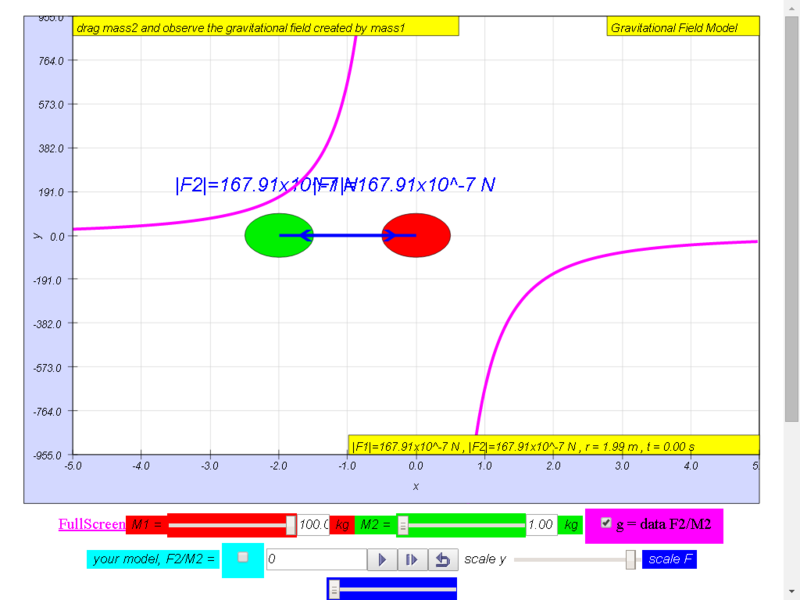 3) The magnitude of the field strength , g varies according to the in inverse square law manner g ∝ 1 r 2 .Hence gravitational field is also known as an inverse square law field. 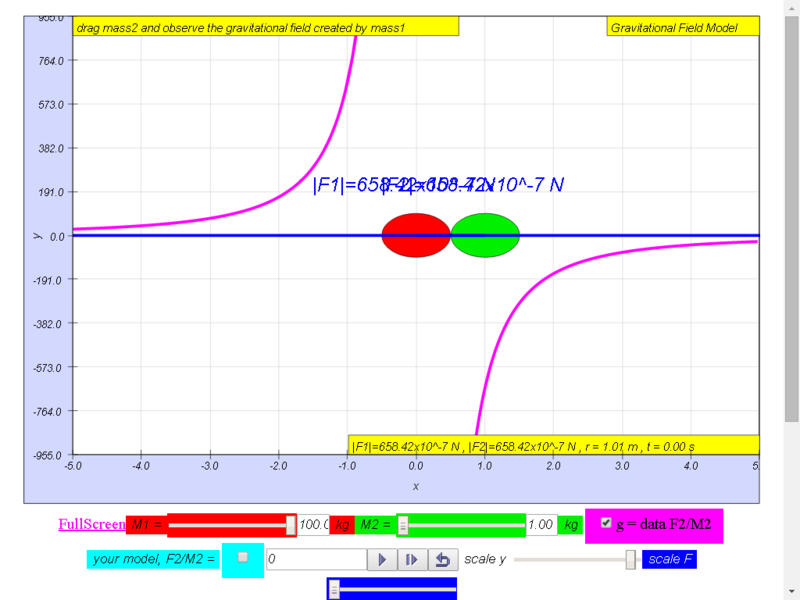 • On the left side of the 100-kg mass, the gravitational field strength points to the right are positive g values. 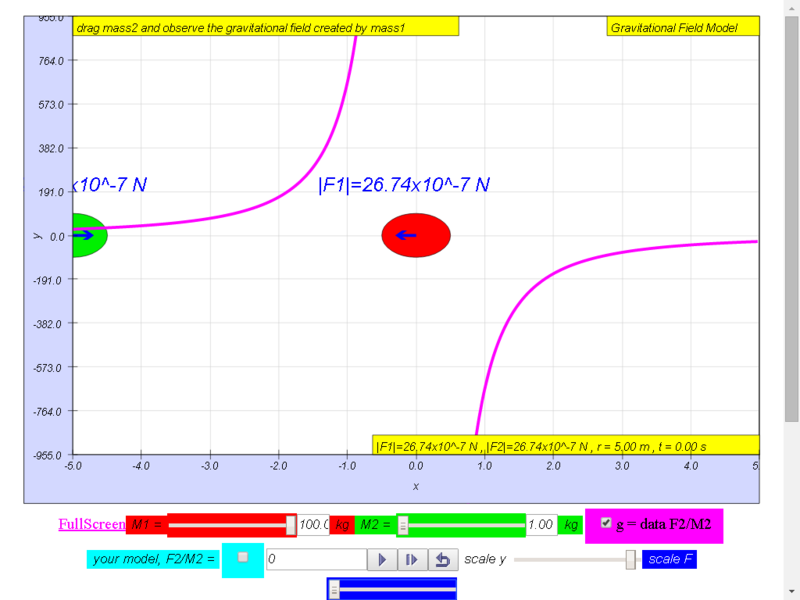 • On the right side of the 100-kg mass, the gravitational field strength points to the left are negative g values. the reason is because of the adoption of the Cartesian coordinate system with positive x direction to the right. 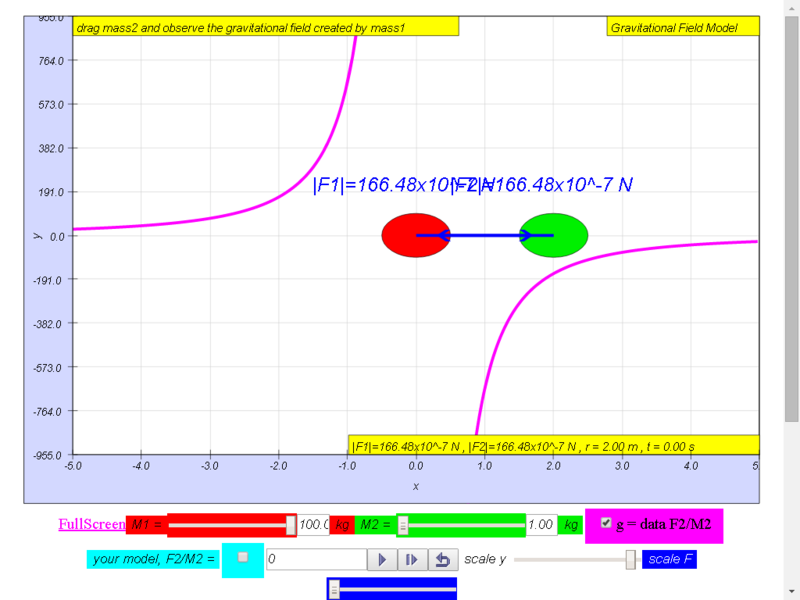 use the model field to propose a mathematically valid equation to represent the gravitational field strength, g.
hint: try typing in expression like 6.67*100/r^2 (left) and - 6.67*100/r^2 (right) separately.